Adventures In Storytime (and Beyond): Another Suspenseful Storytime! Since we had so much fun with the last one, I decided to do another Suspenseful Storytime using a couple of books I had wanted to use, but were checked out before, and one that someone had suggested to me. As I've said before, these are my very favorite kind of storytime books to read; I really love building up the suspense, being very dramatic and spooky, then surprising them with an unexpected, and happier, ending. 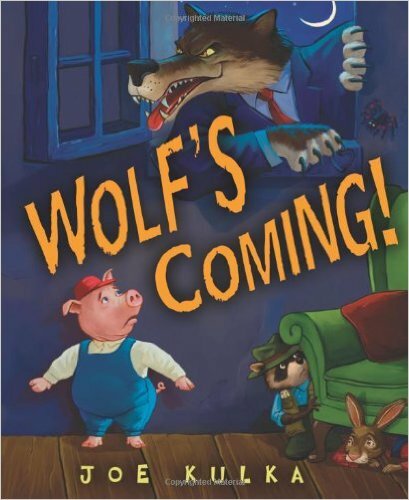 We started with our welcome song and story song, then got right to the first book, Wolf's Coming by Joe Kulka, one of my favorites. 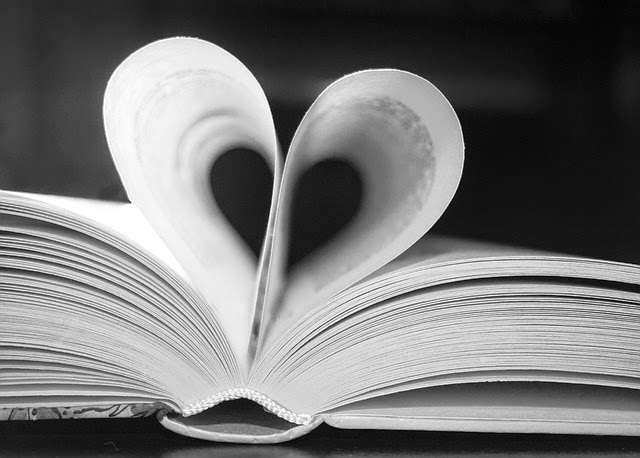 I had wanted to read it last time, but discovered our copy had gone missing and couldn't get another copy soon enough. 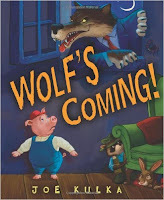 In this story we see all the animals running away and hiding after Wolf's howl announces his approach. Eventually, he reaches the house, and everyone must be still and quiet so he doesn't know they are there. Wolf opens the door, peers inside, and everyone jumps out and yells "Surprise!" It was Wolf's birthday! This book is so much fun, and the dark, eerie illustrations help set the mood, though there is a clue on each page that there is more to the story. 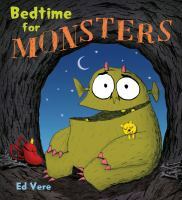 After that it was onto an even scarier topic with Ed Vere's Bedtime for Monsters. Though I've used a couple of his books before, I had not seen this one until a reader suggested to me, and it is very fun and cute, and perfect for this theme. We see a land of monsters, and one monster in particular seems to be licking his lips and thinking of ....YOU! Oh, no! Is he thinking of eating you? If you're a monster and you know it, snort & growl. If you're a monster and you know it, then your growl will surely show it. Smack your claws, stomp your paws, twitch your tail, wiggle your warts, give a roar, do them all. 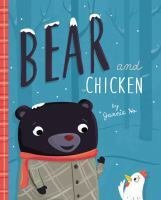 Then our last book is a relatively new on that I have been wanting to use, Bear and Chicken by Jannie Ho. Bear finds a poor frozen chicken while out walking in the snow, and brings him in the house to warm up. Chicken awakens to see Bear preparing to cook something (and Bear's mouthful of sharp teeth)! Chicken soon fears he is on the menu and jumps down and tries to run away, only to be caught by the much faster Bear. But, as it turns out, Chicken had jumped to the wrong conclusion. Another very cute story with cute illustrations. Then we ended with our closing song and stickers. It was Spring Break, so I had a smaller group than usual, and a few stragglers were still eating breakfast. One cute little boy didn't want to miss anything and told me "Miss Jennifer, you can't read any stories until I'm finished with my breakfast." At the end, the same little boy asked for more stories, and when I told him we had already read all three books I brought, he asked me if I would bring some more tomorrow. It's so nice to know that they really do enjoy and appreciate storytime. The liked all the books, but I think Wolf's Coming was the one that had them on the edge of their seats. They loved the twist, and one boy insisted we sing "Happy Birthday" to Wolf, so we did. Monsters had more cutesy rather than dark illustrations, so it was more fun than dramatic, and by the third book they were kinda on to things, so had a feeling that Bear really wasn't planning to cook Chicken. The loved doing the "If You're A Monster And You Know It" song and acting like little monsters.